Animation is the new rage in market. Be it movies, presentations, or videos that we all see on social media, the ubiquitousness of the technology has made one thing quite apparent- the new generation is sold on it. You have to take refuge in the prowess of animation at some point of the time or another. This will make your content stand out and more appealing to users. That\'s why, we are going to discuss some animation tips for beginners to help you get started. While there are many online tools present for you to be able to produce your own animation videos and content, not all of them are free. You might even try scouring the web for templates. But in the end, it always comes down to the point of royalty. So how do you go about it if you are running tight on your budget? Not all templates available online are copyright free. And, most of them obtain a royalty in exchange for usage. You can create your own animation, of course, but it will take a lot of patience and hard work. Especially if you have never before worked with animation tools and technology. One way to go about it is to search the internet for video tutorials. These tutorials will take you through the basics of animation, tools you would need, and animation tips that you might want to keep in mind while designing and producing your own animation. But this way, as it seemingly is clear, is lengthy and tedious. And it absolutely won’t work for you if like your budget, you are also running tight on your time. The next best thing to do comes in the form of royalty-free animation tools. Are they even there? Well, yes. Certainly. As certain as you are reading this article. There are loads of royalty free tools available in the market for you to start creating your own awesome animations in literally no time. You can even buy royalty free animation online pre-baked for you to use in your videos and other content. You can find these royalty free motion graphics at any online digital art gallery. These galleries feature works from animation artists selling their work online without any copyrights. Even if the work is copyrighted, you can pay the copyright charge and then use their work with due credits. If however, you want to create the royalty-free animation of your own, there are a few things you would need to do. Here’s a list of tips for beginners that you will need to follow to create your own animation. 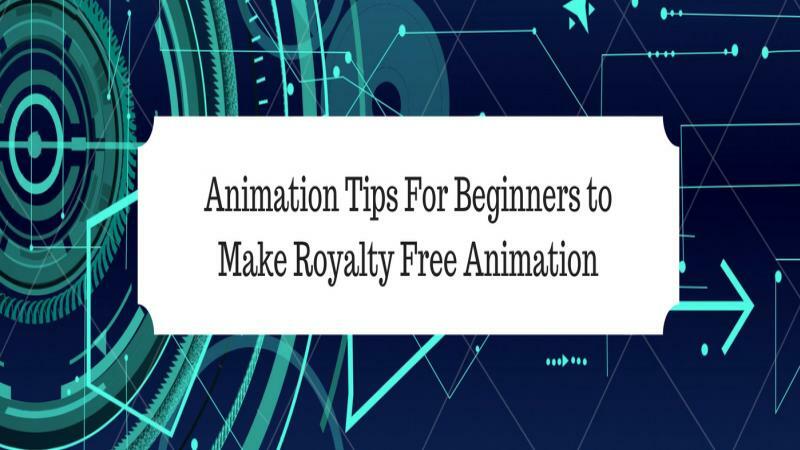 First things first; you would need to install or register on a royalty-free animation software that you could work on to create your own animations. Tools like Biteable let you create your own animation templates and designs for videos and presentations. To use any of these applications, you would need to sign up first and then set them up on your PC. You can select a membership option according to your choice. You can sign up for a premium membership at minimal monthly charges to use the software in full flow and to your maximum benefit. If you want to use a toll for free, you can opt for the regular free membership. In this case, you can still avail almost all the features except the ones reserved for premium members. Some of the free limitations imprint watermark at the bottom of the animations you make. Canva's free Online Presentation Software can help you create stunning presentations that will surely engage your audience the quick and easy way, thanks to its intuitive, easy-to-use drag-and-drop design platform that's online and free to use. When the application first opens up on your system, you are put face to face with its workspace. This is the place where you will build and learn. It is important that you get familiar with the application workspace. You can watch videos concerning the app you are using to create the royalty-free animation of your own. This step becomes furthermore important if you are going to be make your videos from scratch. So, read guides on the help menu of the app or watch the online tutorials online to get familiar with the tools and features of the software. Try out and explore some of the tools on your own. Get your hands dirty before you start making the real thing. Here, is an important animation tip. After you are familiar with the workspace of software, it’s time to begin the actual work. Now, you can start from scratch or use the already available templates to create your animation video. If you are comfortable with spending time working on your video, we suggest you start from scratch and go for the real video-making tools. You will get plenty of tools to insert pictures, animations, texts into your video and to resize and reshape them. A lot of animation options are also available for you to choose from. With some of these applications, you can also create your own animation paths. It’s all up to you. This is your play space. Try things out and see how they look. Discard them if what you get is not what you are looking for. Keep them if they look good to you. This is the way to go if you are going to learn to create things from scratch. If you are running short on time, you can go for the ready-made templates available on the software to create your own videos and animations. The patterns and animations are all pre-defined and you just need to insert your desired pictures, text, and content in the allocated space. Save your video after you are satisfied with the results and voila! It’s ready to be published. Congrats! You just made your first royalty free motion graphic. Way to go! Once you have created your animation you will be glad you did it. Still if you are not satisfied, do not give up. Give it a try again till you get a result you wanted. If you want to sell your animation online, you can look for websites like Showflipper. You can also look for references at any online animation gallery to view other digital artist\'s work.